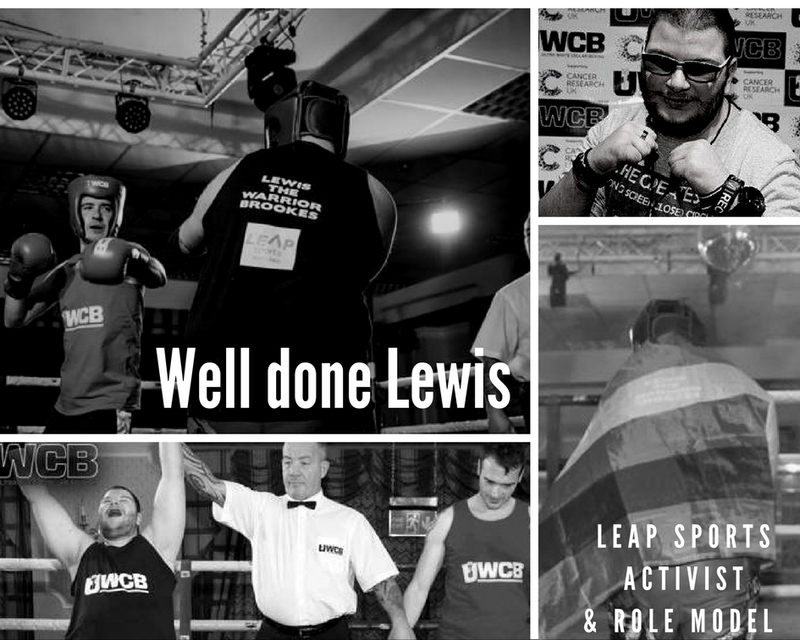 Lewis wins in Aviemore | LEAP Sports Scotland LEAP Sports Activist Lewis Brookes, entered the boxing ring in a fundraising event to raise money for a cancer charity. "> LEAP Sports Activist Lewis Brookes, entered the boxing ring in a fundraising event to raise money for a cancer charity. Lewis also wanted to raise awareness of LGBTI people in sport and took part wearing a LEAP Sports logo and a rainbow flag in his corner. We caught up with Lewis who said “As well as raising money for cancer, I wanted to raise awareness of disability and transgender issues, and to show the world that lgbti and disabled people can take part in sport . I felt proud to do it i always wanted to try boxing and this was best way to try”. As well as battling in the ring, Lewis battled his own anxiety due to how others might view his disability and being an out gay trans man. We’d just like to say well done to Lewis for sticking through all the training, for taking part, and for winning. Written on 2nd December 2016.